We’d love your help. 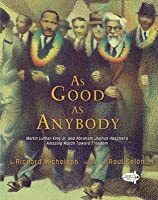 Let us know what’s wrong with this preview of As Good as Anybody by Richard Michelson. MARTIN LUTHER KING, Jr. and Abraham Joshua Heschel. Their names stand for the quest for justice and equality. Martin grew up in a loving family in the American South, at a time when this country was plagued by racial discrimination. He aimed to put a stop to it. He became a minister like his daddy, and he preached and marched for his cause. Abraham grew up in a loving family MARTIN LUTHER KING, Jr. and Abraham Joshua Heschel. Their names stand for the quest for justice and equality. Abraham grew up in a loving family many years earlier, in a Europe that did not welcome Jews. He found a new home in America, where he became a respected rabbi like his father, carrying a message of peace and acceptance. To ask other readers questions about As Good as Anybody, please sign up. This is a very unique story that tells of how Abraham Joshua Heschel came to the aid of Martin Luther King, Jr. at the time of the civil rights march in Selma. It begins the book with Martin as a child, and then it tells the story of Joshua as a child. It moves on to tell about their lives as grownups, up until the point where their paths cross. There are several parallels shown between the lives of the two children, which helps the reader understand what led to their eventual friendship. Their is a brief Afterword following the story that lets the reader know about the end of both Heschel's and King's lives. This was a beautiful story that skillfully wove together the similarities of being persecuted as a Jew and as an African-American. It continues to describe a friendship between two powerful, passionate men committed to finding justice for all. It's a testament to the influence of individuals as well as what can happen when both blacks and whites come together. The pictures are made with a fuzzy look to them. To me, this made the story feel more like a memory, which I liked. There weren't a lot of facial details, but I felt that served this story well, as it was more about a group of people coming together than the accomplishments of just one person. 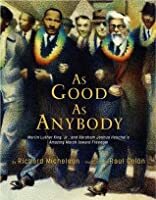 As Good as Anybody is a beautifully written true story about two men from different backgrounds coming together to march for equality for all; Martin Luther King, Jr. born in 1929 in Atlanta, Georgia and Abraham Joshua Heschel born in 1901 in Warsaw, Poland. Both men faced discriminated for different reasons in different parts of the world yet found friendship and respect in each other. I love this book and how it shows that those most discriminated against are just like anyone else. It talks about Martin Luther King, Jr. and Abraham Joshua Heschel and their march toward freedom. It gives children the opportunity to learn about a crucial time in our history in a simple, yet factual way. I would definitely recommend this book. I absolutely LOVED this book. This book merges the stories of Martin Luther King Jr. with Rabbi Abraham Joshua Heschel. The first half of the book covers MLK's boyhood up to the point of his famous march. At that point, it breaks off and tells the story of Heschel. The book joins them up at the end as they marched together for a common purpose. Excellent message and illustrations. Abraham Joshua Heschel joins Martin Luther King as both men follow the path of the 1965 civil rights march from Selma to Montgomery. Both men understand the need for different religions to walk that same path; because the forces that try block them from moving forward are unified in their hate. Valuable lessons to be learned today - now more than ever. This review has been hidden because it contains spoilers. To view it, click here. My 9-year-old enjoyed this book about Martin Luther King, Jr and Abraham Joshua Heschel. It was informative but told in a story rather than facts, like some other books we've read on Martin Luther King, Jr. It starts with Martin as a young boy who is mad at everyone because of segregation but he really looked up to his father and his mother told him, "Don't you ever forget that you are just as good as anybody!" He became a minister and told his congregation to stop riding the bus (after the experi My 9-year-old enjoyed this book about Martin Luther King, Jr and Abraham Joshua Heschel. It was informative but told in a story rather than facts, like some other books we've read on Martin Luther King, Jr. He became a minister and told his congregation to stop riding the bus (after the experience with Rosa Parks) until they could sit wherever they wanted. The people stopped riding the bus for one year! The bus companies were losing money so the U.S. Supreme Court finally changed the law. He organized protests and marches and put out a call for all of God's children to join with him. The story then switched over to Abraham, a Jew who lived in America but was originally from Warsaw, Poland. Abraham became a rabbi. At that time, Hitler was elected leader of Germany and Jews weren't allowed to go many places. He'd heard about people being treated fairly in America and decided to go there. Hitler invaded Poland and his mother and three sisters were killed. Abraham began marching across America speaking out for peace and equal rights. He joined with Martin Luther King, Jr.
On 03/21/1965, in Selma, Alabama, the two men joined together in prayer with more than 3000 people cheering them on. This is a wonderful story of both African American and Jewish civil rights. It is a 2009 winner of the Sydney Taylor award. This story follows the lives of two different American civil rights' leaders. One, Dr. Martin Luther King Jr., was an African American Baptist minister, and the other, Rabbi Abraham Joshua Heschel, was a Polish American immigrant. The story begins by telling the tale of Martin's experiences with segregation in the South. It discusses how his parents' outlook guided him to b This is a wonderful story of both African American and Jewish civil rights. It is a 2009 winner of the Sydney Taylor award. This story follows the lives of two different American civil rights' leaders. One, Dr. Martin Luther King Jr., was an African American Baptist minister, and the other, Rabbi Abraham Joshua Heschel, was a Polish American immigrant. The story begins by telling the tale of Martin's experiences with segregation in the South. It discusses how his parents' outlook guided him to become a minister and seek a better future for his people. This is paralleled by Abraham's experiences with anti-semitism and the beginning of World War II in Poland. Abraham's parents also taught him to treat all people equally and led him to become a Rabbi and a leader. To stand up to unfair treatment of all people, Heschel and King joined together to lead a march from Selma, Alabama to Montgomery. They remained great friends for the rest of their lives. This book starts with the story of Martin Luther King Jr. He begins as a small boy who does not think it is fair that he does not have all the same rights as WHITE people. His mom said it will be different in the next world, but he wanted it to be different now. He began going around the country speaking out. Then it goes on to tell the story of Abraham Joshua Heschel. He is a Jew living in Europe during the time of Hitler. He also believes that it is not fair and wants to do something about it. This book starts with the story of Martin Luther King Jr. He begins as a small boy who does not think it is fair that he does not have all the same rights as WHITE people. His mom said it will be different in the next world, but he wanted it to be different now. He began going around the country speaking out. Then it goes on to tell the story of Abraham Joshua Heschel. He is a Jew living in Europe during the time of Hitler. He also believes that it is not fair and wants to do something about it. He travels to America and begins speaking out. He meets Martin Luther King Jr. and they start a march together. I like how it takes the two stories and puts them together at the end. Even though these two come from different backgrounds they are very similar. This book follows the story of two distinct and unique men who eventually joined forces in an actual display against prejudice. Each man's story is presented separately with a focus on their childhood and the influence of their fathers followed by their adult life and work. These stories then culminate in a description of the march for equal rights which brought them together. Both experienced prejudice and felt a compelling need to reverse the injustice that they both experienced. The story is This book follows the story of two distinct and unique men who eventually joined forces in an actual display against prejudice. Each man's story is presented separately with a focus on their childhood and the influence of their fathers followed by their adult life and work. These stories then culminate in a description of the march for equal rights which brought them together. Both experienced prejudice and felt a compelling need to reverse the injustice that they both experienced. The story is enhanced by illustrations with an antique appearance. 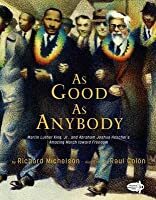 "As Good as Anybody" can be used to support any study on human rights including major historical events like the Holocaust or Civil Rights Movement. It can be appreciated by all ages, and is written for grade 3 - 6. This book takes on a new and unique look at Dr. Martin Luther King's marches for equality. This book shows that people beyond the African American culture understood and supported the plight of the African American's. The story begins with the familiar tale of Dr. Martin Luther King. Then it talks about Abraham Joshua Heschel who also suffered prejudice in Warsaw, Poland during the time of Hitler. He came to America for freedom and here he spoke out for peace and equal rights for everyone. This i This book takes on a new and unique look at Dr. Martin Luther King's marches for equality. This book shows that people beyond the African American culture understood and supported the plight of the African American's. The story begins with the familiar tale of Dr. Martin Luther King. Then it talks about Abraham Joshua Heschel who also suffered prejudice in Warsaw, Poland during the time of Hitler. He came to America for freedom and here he spoke out for peace and equal rights for everyone. This book touched my heart. 2 men treated unfairly coming together to fight for their freedom. A Jew a Black their story. "I solemnly pledge to uphold the fair name of the Jews. Not only because we need their friendship, and surely we do, but mainly because bigotry in any form is an affront to us all." -Reverend Martin Luther King Jr.
"100 years ago, the emanicipation was proclaimed. It is time for the white man to strive for self-emanicpation, to set himself free of bigotry." -Rabbi Abraham Joshu This book touched my heart. 2 men treated unfairly coming together to fight for their freedom. Audience: 2nd to 4th Grade and a good tool for librarians teaching biography. Appeal: The cover and the illustraions are very vivid in color and they look like crayon drawings that will appeal to this grade group. The story matches the pictures well and the text is not hard to understand, it is written in a way that quite a bit of information is condensed into a moving, informtive story. Good descriptions of the important events in the life of Dr. King and his inner feelings. Awards: Sydney Taylor Audience: 2nd to 4th Grade and a good tool for librarians teaching biography. the artwork is beautiful, the story familiar but jarring. What a timely reminder for all of us that injustice still exists and that we must continue marching to combat it. Sadly, it made me think of some of our current candidates for president--the ones who claim to be people of faith but still spew hatred and discrimination from their podiums. As long as inequality exists (and it is thriving), people of faith must follow the example of Martin and Abraham. This book is awesome because it celebrates how two movements can work together - in this case, the work of Dr. Martin Luther King Jr. and his collaboration with members of the anti-Semitism movement. I think many Americans perceive the Civil Rights Movement as something that was driven in isolation by African Americans, and I think that denigrates the movement as a whole. This book gives a larger picture. "How can we love our neighbors," he asked, "if we abandon them in their time of need?" Excellent book that first tells the story of Martin Luther King Jr.'s anger and inspiration to upend injustice followed by Abraham Joshua Heschel's own journey in Europe. At the end, the two men meet in America and join in the peaceful call for integration and equality at the march in Selma of 1965 where "there were not enough police in the state to hold them back." If you are looking for a good story book to introduce a young person to the work and especially the marches of Martin Luther King Jr, this is the perfect option. Seeing how Heschel learned from what happened to his family in Germany and taking those lessons to America where he was compelled to march alongside King is just the message many could use right now. Parallels the story of MLK with that of his little-known ally, Abraham Joshua Heschel. Awesome because it reveals how both men experienced injustice as children--as black & Jewish--and grew up determined to change things. The narrative of their childhoods is deliberately parallel. Awesome illustrations by a Latino from NYC make this book a truly multicultural work of love. A very approachable story for early childhood, it tells the basic story of MLK's life; also includes background of Abraham Joshua Heschel, a Jewish immigrant who fled Hitler in Poland and marched with Dr. King. No details about the death of Dr. King; some graphic images of dogs attacking protestors. This book is the most inspiring book about activism that I've read for children. Most kid's books about activists just tell about what a certain person did, they don't particularly inspire the reader to do anything. This book is amazing and gorgeous and talks about the importance of uniting all oppressed people even though the come from different backgrounds.